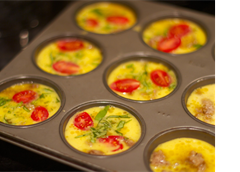 Easy Make Ahead Breakfast Frittatas For Your Family - Energetic Juniors - Contact Us! Mornings can be very hectic, the stress of getting yourself and your family ready on time can make breakfast seem like a large obstacle. I like this easy, simple, make ahead and easily adjustable to what you have in the fridge recipe that families can use for breakfast or to eat on the go. The possibilities are endless. This recipe is also a great for involving your children in the cooking process, its like baking but you end up with a healthy delicious breakfast! For variety you can use different vegetables like mushrooms, onions or zucchini, especially if they were already roasted . Then you may even modify the cheese (mozzarella, manchego, feta) and top with herbs (basil, cilantro) or even mix in some pesto. You can either serve plain, or on a roll to make a breakfast sandwich (tip: add some avocado slices) or you can throw 2-3 on a salad or even some zucchini noodles with it to make it a lunch. Enjoy them cold or warm.